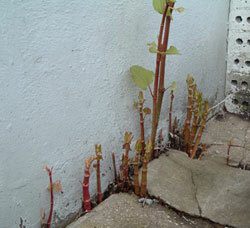 Japanese knotweed spring growth through concrete paving. Phlorum can assist with the identification and subsequent removal of Japanese knotweed problems. Send us your photos and we will, free of charge, let you know if there is any knotweed identifiable in them. Most domestic Japanese knotweed infestations can be eradicated by herbicide spraying. This is the cheapest option but will usually take several years (3-4 years, or occasionally longer, depending on the maturity and area covered by knotweed). Phlorum offers specialist and bespoke Japanese knotweed removal for home owners in the United Kingdom. For further information please call us. We are also experienced in acting as Expert Witnesses and providing Proofs of Evidence for situations where support on knotweed legal issues is needed. If you need a lawyer, we can also recommend suitably experienced and skilled solicitors who work in this specialist area. At Phlorum we have significant experience in successfully helping people who are seeking mortgage finance on properties affected by Japanese knotweed. If you are trying to purchase or sell a property that is affected by Japanese knotweed, then please get in touch with one of our expert domestic knotweed consultants who will be happy to help. The issue of being refused a mortgage due to Japanese knotweed has been a major problem for many home buyers. Thankfully, Phlorum’s involvement with the Royal Institution of Chartered Surveyors (RICS) and the Property Care Association (PCA) Invasive Weed Control Group (IWCG) has essentially solved this problem. In recent years, many banks and building societies have refused mortgages on properties affected by Japanese knotweed. In many cases this has included knotweed plants located on adjacent properties up to 30m away! However, guidance published by the RICS, which Phlorum helped to write, is changing this. In addition to requiring the RICS guidance for surveyors undertaking mortgage valuations, the Council of Mortgage Lenders and the Building Societies Association advised the Japanese knotweed treatment industry that they should form a trade body. This was to enable lenders to recognise properly qualified and externally audited professionals who could apply best practice measures to treat Japanese knotweed on affected properties. Consequently, in April 2012, the Invasive Weed Control Group (IWCG) of the Property Care Association (PCA) was formed, with Phlorum being a founding member. Through the RICS guidance and the IWCG trade body, surveyors and mortgage lenders now have a system in place to help them determine and understand the risks associated with Japanese knotweed growing on or near property. This should prevent many banks and building societies from refusing mortgages due to their previous difficulties in quantifying property risks caused by Japanese knotweed. Key to the RICS guidance (which you can find here) is the creation of Japanese knotweed risk categories, which have been informed by the previous work of the Cornwall Knotweed Forum. These categories are reproduced from the RICS guidance in the following table. Japanese knotweed is within 7 metres of a habitable space, conservatory and/or garage, either within the boundaries of this property or in a neighbouring property or space;and/or Japanese knotweed is causing serious damage to outbuildings, associated structures, drains, paths, boundary walls and fences and so on.Further investigations by an appropriately qualified and/or experienced person are required. Although Japanese knotweed is present within the boundaries of the property, it is more than 7 metres from a habitable space, conservatory, and/or garage. If there is damage to outbuildings, associated structures, paths and boundary walls and fences, it is minor.Further investigations by an appropriately qualified and/or experienced person are required. Where the risk category states that further investigations should be undertaken by an appropriately qualified person, the RICS guidance recommends that this should be an approved member of the PCA IWCG trade body. Membership of this body should satisfy the lender that the Japanese knotweed issue is being dealt with professionally. If need be, the lender may require the cost of any knotweed treatment works to be taken off the value of the property affected. In such cases, Phlorum can arrange for the treatment costs to be fully secured and protected as a bonded payment into a UK Government escrow account, through Transpact. Other warranties and insurance packages can also be provided depending on the requirements of each project. Japanese knotweed can be a serious problem for home owners. There are no quick-fix herbicide treatments to ensure immediate Japanese knotweed eradication. There are chemicals, such as RoundUp™ with the active ingredient glyphosate, which are available at good garden centres and equivalent stores, but these are significantly weaker than the products available to licensed herbicide sprayers. Stem injection, using syringes or specially designed injector-guns, is another method of applying herbicide in a very focused area in order to prevent herbicides affecting plants close to the Japanese knotweed being treated. Researchers at the universities of Exeter and Swansea have separately tested this method and has found it less effective than foliar applications using a spray. Stem injection can also be unnecessarily labour intensive and wasteful of undiluted herbicides. It should not, therefore, be a standard method for treating all Japanese knotweed infestations. If you are in any doubt about the risks of tackling Japanese knotweed on your own, then seek the guidance of an expert. If you are unsure which Japanese knotweed treatment you require, please don’t hesitate to contact one of our expert consultants, who will offer advice based on your specific circumstances.